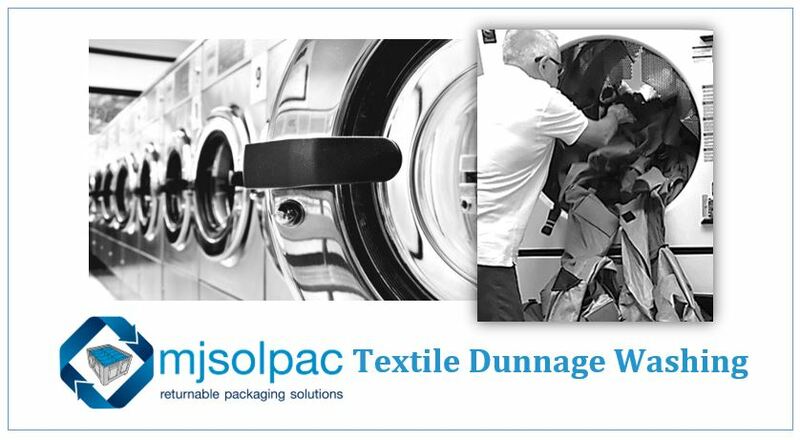 Make sure you get more use out of your returnable packaging with Mjsolpac textile laundering and repair service. Our new textile dunnage washing service aims to extend service life, and best protect your parts, by restoring the dunnage to a like-new condition. In most cases, once textile dunnage becomes soiled and starts damaging the components they are disposed of and new dunnage purchased to replace it. However, the need to reduce pollution and waste for our customers has led Mjsolpac to offer a laundering and repair service so our products can re-used many time. Textile dunnage is collected from designated sites at agreed intervals. It is laundered, inspected and repaired if required at our Telford facility, and then your fit for purpose re-usable dunnage is delivered back to site. We can launder pretty much any textile so long as it is flexible, so not full of rigid plastic reinforcement for example. Small metal hooks are no problem. Repairs can also be undertaken at the same time.